The Japan Aerospace Exploration Agency (JAXA) performed the lunar orbit injection maneuver (LOI1) for the "KAGUYA" (SELENE) at 6:20 a.m. on October 4, 2007 (Japan Standard Time, JST.) The KAGUYA is a lunar explorer launched by the H-IIA Launch Vehicle No. 13 (H-IIA F13) on September 14, 2007 (JST) from the Tanegashima Space Center. 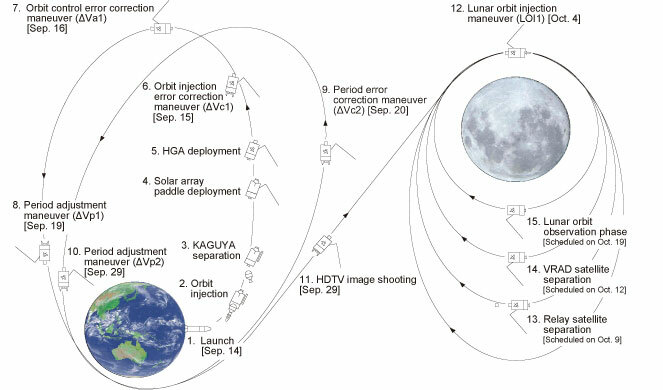 As a result of the orbit calculation after the maneuver, we have confirmed that the KAGUYA was injected into the following lunar orbit. The satellite is confirmed to be in good health. We are now pleased to be able to report to you that we have safely delivered messages and signs that were collected from 412,627 people around the world through the Wish upon the Moon Campaign and engraved on the sheets to be aboard the KAGUYA to the Moon. We would like to express our profound appreciation to all participants and hope your continued support to the KAGUYA mission.